I have an unreasonable obsession with farmers’ markets. I enjoy the good food, colorful produce, free samples, people-watching, and knowledge that is spread. The past few days of rain wiped out the strawberry crops. 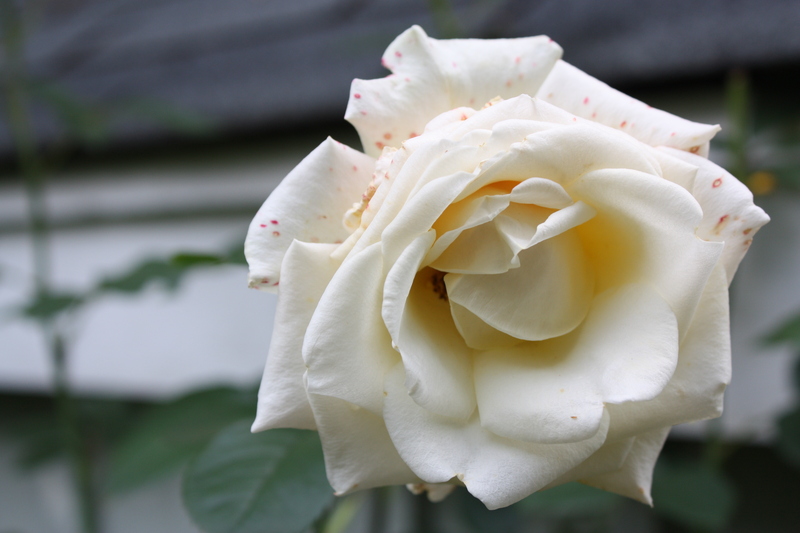 And while that is unfortunate, it provides a good lesson of following mother nature and determining what you eat based on what is in the garden. So I bought some tomatoes. 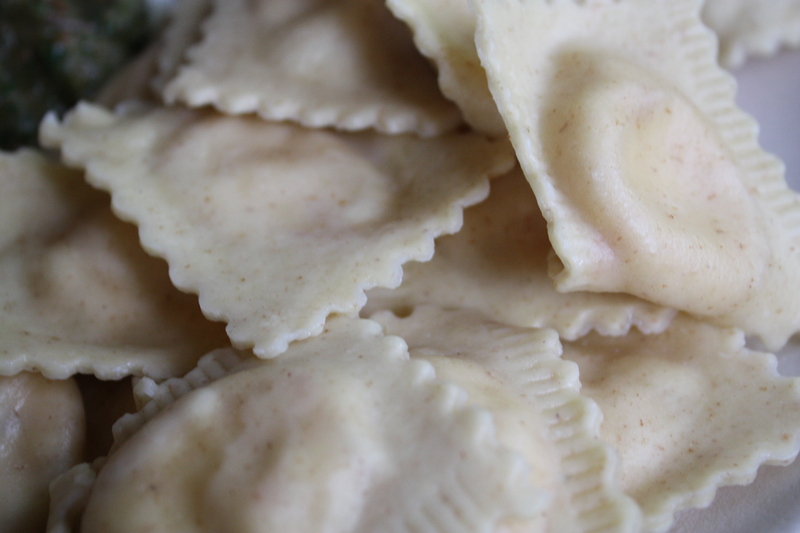 And some Sundried Tomato and Smoked Mozzarella Ravioli from Nella Pasta. Made in Jamaica Plain, MA, this pasta was phenomenal. The two women owners suggest serving the pasta with just a bit of butter or extra virgin olive oil. The pasta cooks up in mere minutes, so this is the perfect solution for a scrumptious, quick meal. I ended up making a small side of Homemade No-Oil No-Nut Basil Pesto. My dad had a baked chicken breast as well, and I served a simple cucumber, tomato, onion salad with vinegar. I made half of the recipe for Homemade No-Oil No-Nut Basil Pesto because I only needed a small amount to serve next to the pasta. 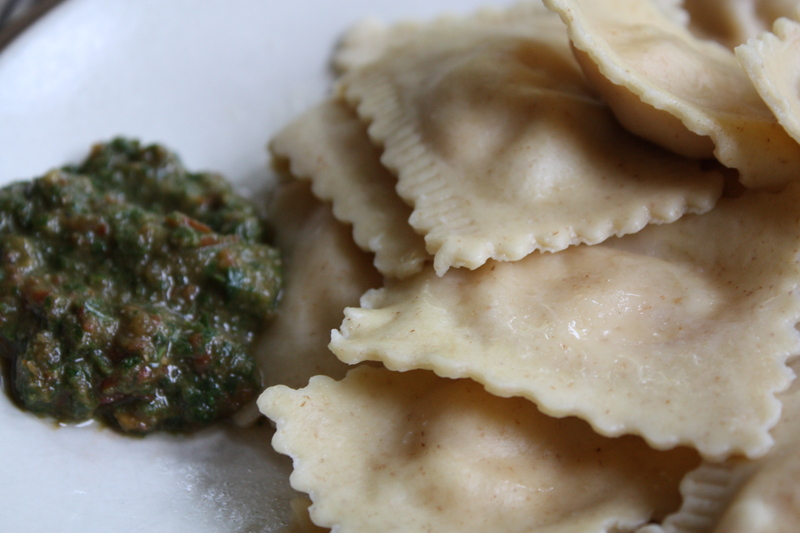 Pesto without pine nuts is a different taste, with more emphasis on the basil flavor. 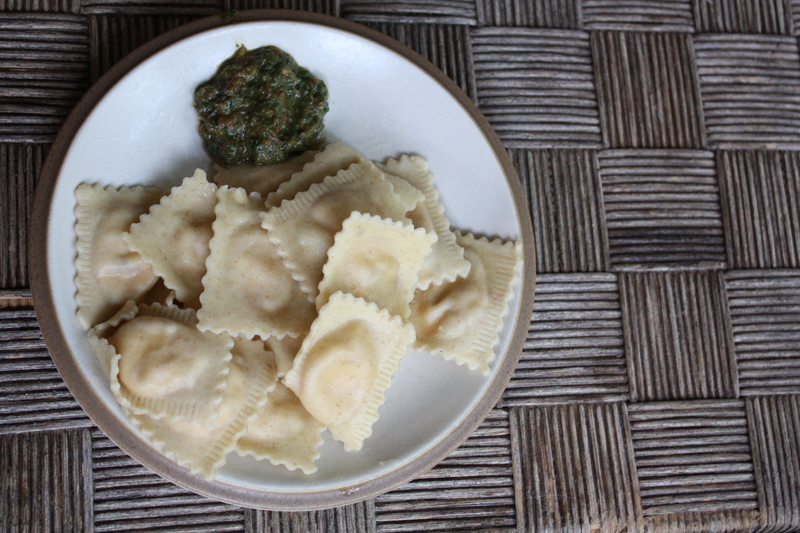 This was garlicky and full of basil, a perfect complement to the pasta. I suppose a store bought pesto would be tasty next to the pasta, but fresh basil is just so satisfying. 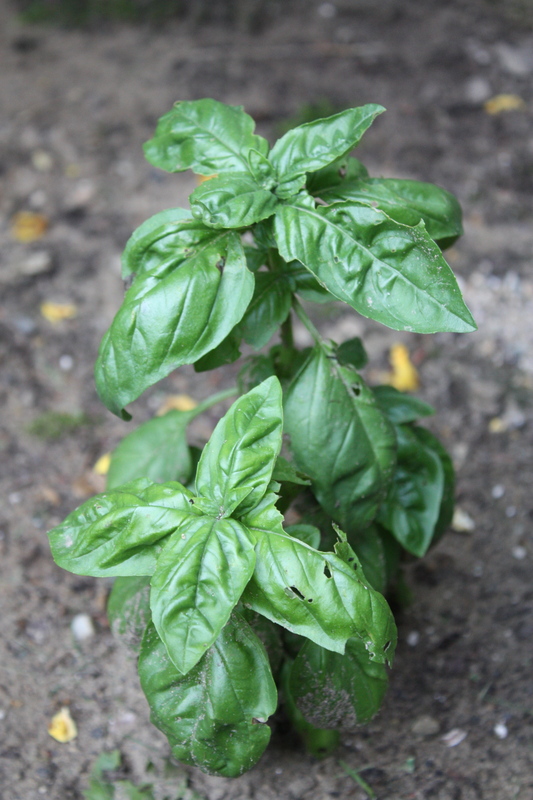 When I volunteered at the farmers’ market, I learned about the oxidation of basil leaves in pesto. If your pesto looks dark, as mine did, it can be attributed to both the tomatoes and also oxidation. Over time as the pesto sits in your refrigerator, the color will deepen. With a good stir, you should see more green appear. This is a good sign of how fresh your pesto is: if your store bought pesto takes a while to darken, there may be additives. In a small processor, blend all ingredients including the cheese, which can be added to your preference. Blend until smooth. Keep refrigerated.